Click image to enlarge Eighteenmile Island, Oregon. 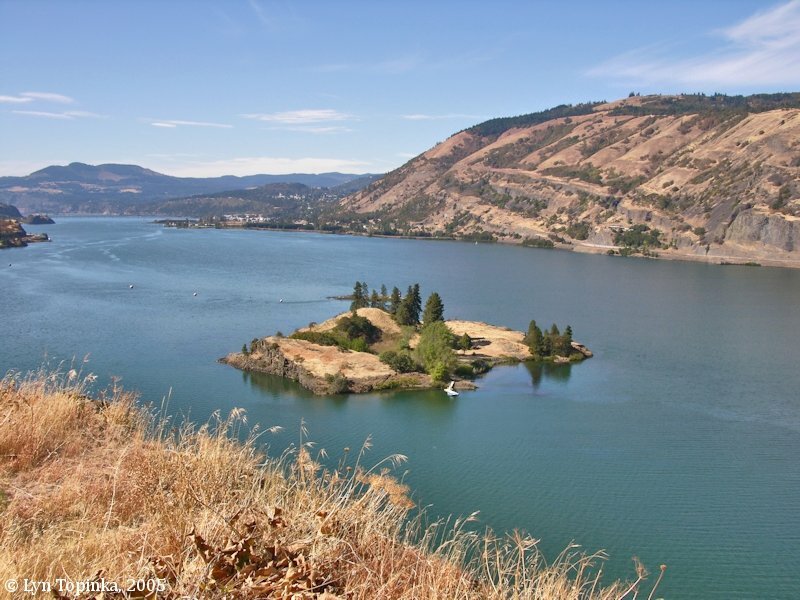 View from trail to the Mosier Twin Tunnels, Oregon. Image taken September 18, 2005. 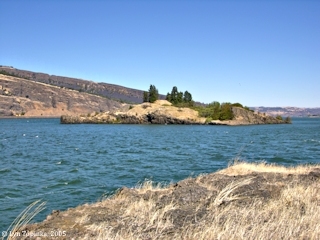 Eighteenmile Island borders the Oregon side of the Columbia River at River Mile (RM) 174, just downstream of Mosier, Oregon and four miles upstream of Hood River. 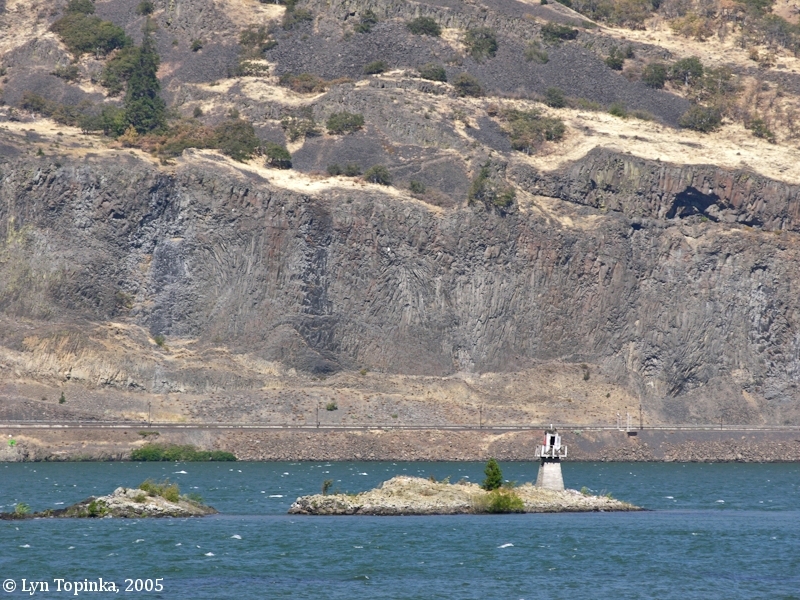 The Dalles, Oregon, is located 16 miles upstream and The Dalles Dam, once the location of the Long and Short Narrows of The Dalles, is located 18 miles upstream. 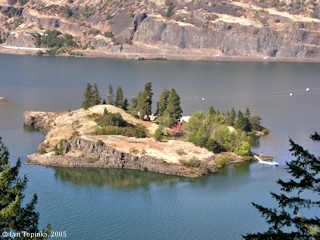 The 9-acre island can be nicely viewed from Interstate 84 which runs parallel to the Columbia River on the Oregon side. 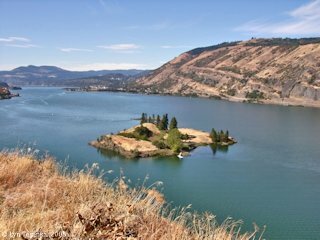 The island can also be viewed from the eastern section of the Historic Columbia River Highway State Trail, which has it's trailhead west of Mosier. The basalts of Bingen Gap are a backdrop for the island. 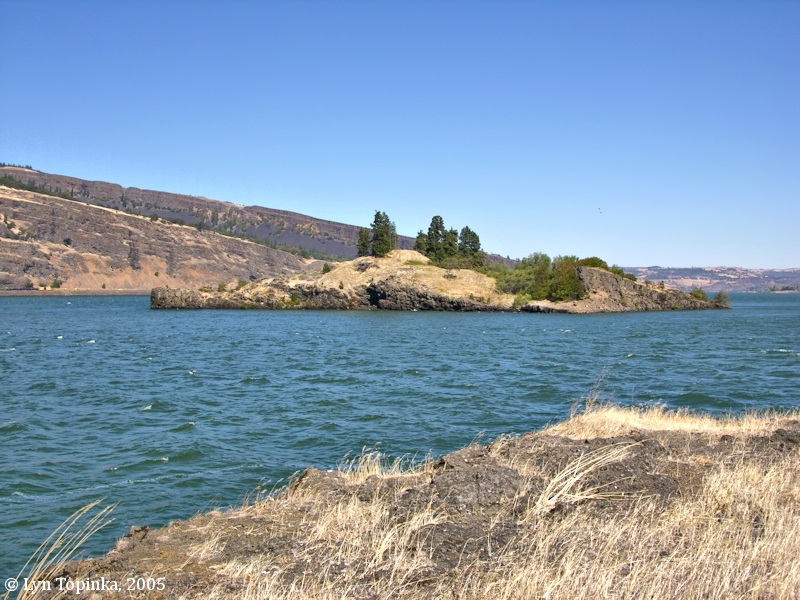 There is a navigational light located on a small rocky "island" off the downstream tip of Eighteenmile Island. Eighteenmile Island was often called "Chicken Charlie's Island" by local residents. The 1919 cadastral survey (tax survey) for T2N R11E Section 3 shows "G.W. Reither" living on "18 Mile Island". The U.S. Bureau of Land Managements' General Land Office Records has George W. Reither being granted title to 9.75 acres of T2N R11E Section 3, on August 16, 1922 (Homestead Entry Original of 1862). The 1934 USGS 1:125,000 topo map "The Dalles" has the island labeled as "Eighteenmile I. ", and the 1946 NOAA Chart "Columbia River Bonneville to The Dalles" has the island labeled "Eighteenmile I.". Click image to enlarge Eighteenmile Island, Oregon. Basalts of the Bingen Gap are in the background. View from off of Interstate 84, Oregon. Image taken August 27, 2005. 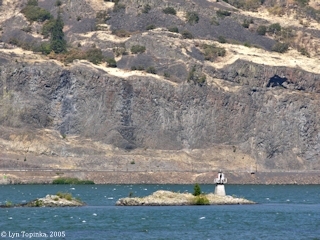 Click image to enlarge Light west of Eighteenmile Island, Oregon. Basalts of the Bingen Gap are in the background. View from off of Interstate 84, Oregon. Image taken August 27, 2005. Click image to enlarge Eighteenmile Island, Oregon. View from Mosier Twin Tunnels, Oregon. 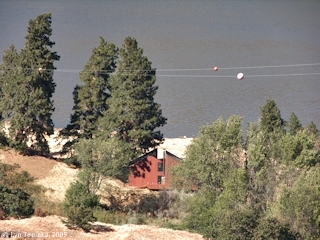 Image taken September 18, 2005.